Pipelines leak. It’s what they do. And the Dakota Access pipeline will be no exception. The 1,168 mile-long pipeline is intended to transport crude oil from the Bakken oil fields in North Dakota to Patoka, Illinois, passing through South Dakota and Iowa. From there, it will connect with another pipeline to transfer oil to terminals and refineries along the Gulf of México. However, its construction has hit a snag in Standing Rock, North Dakota. Since September the Standing Rock Sioux Tribe and allies from around the world have been pushing hard to prevent the pipeline from cutting through Sioux Treaty territory. 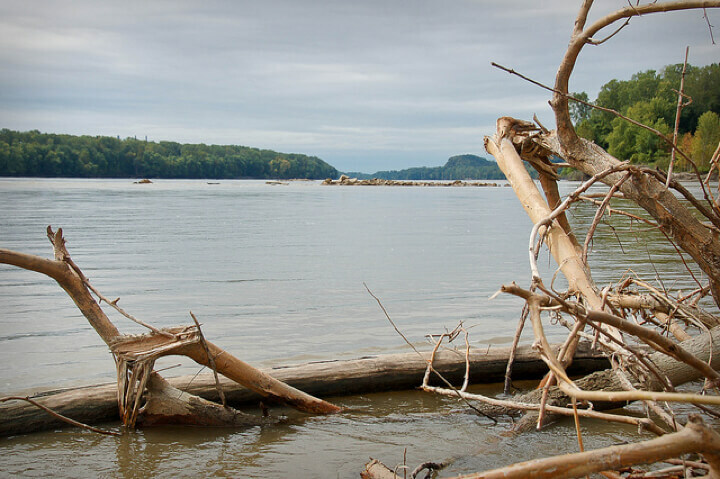 The water protectors maintain–under enormous pressure from the government—that construction of the pipeline must be halted immediately to protect the waters of the Missouri River and “the very survival” of the tribe. 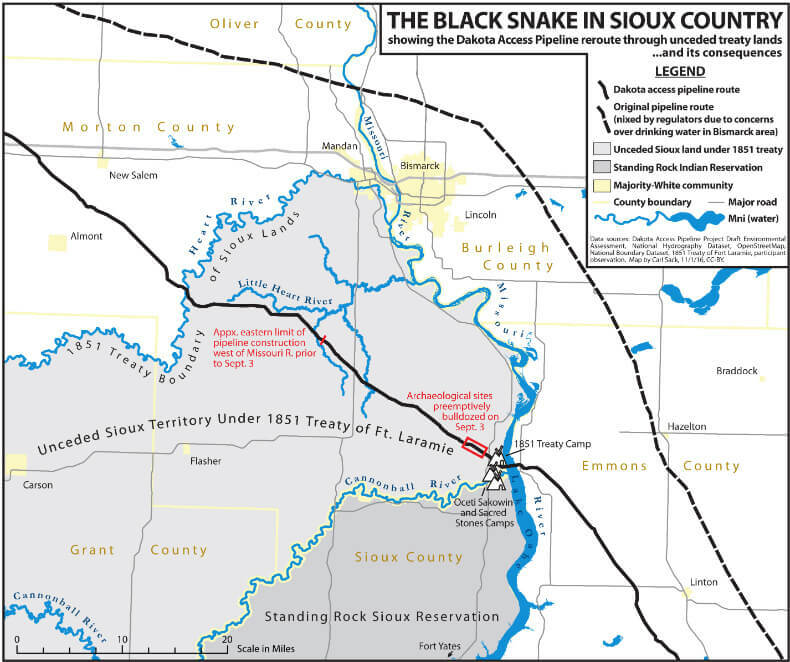 The pipeline will cross under the Missouri River, the longest river in the United States and the sole water source of the Standing Rock Sioux Tribe. Pipeline ruptures happen all the time. It’s a fact. An excavator might dig in the wrong place. The pipeline might start leaking due to corrosion. It might explode due to poor operation. It could even break due to improper construction or the use of substandard materials. Scorching land, torching homes—and killing multiple people. If the DAPL were to follow this environmentally destructive trend, there would be far reaching consequences for the Standing Rock Sioux and potentially millions of other Americans. Contaminated water from North Dakota has the potential to hit twelve states, all the way to Louisiana, wreaking havoc across America’s heartland. Then there’s even more concern surrounding the quality of construction. 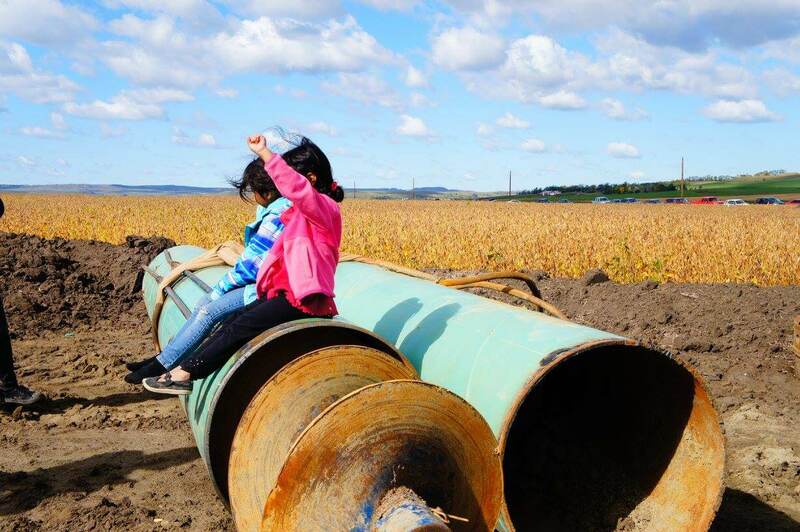 Standing Rock Sioux tribal chair, Dave Archambault II, recently pointed out that the company has been “[…] rushing to get the pipeline in the ground” in order to meet a looming deadline. According to a report last month by The Institute for Energy Economics and Financial Analysis and Sightline Institute, Energy Transfer Partners conceded in court that it has a contractual obligation to start delivering oil by Jan. 1, 2017. “If it misses this deadline, companies that have committed long-term to ship oil through the pipeline at 2014 prices have the right to rescind those commitments,” the report states. Energy Transfer Partners told APTN that this deadline is no longer valid, however, the damage may already be done. The Standing Rock Sioux Tribe also contests the pipeline because it threatens culturally, spiritually, and environmentally significant areas. Some of these areas have already been cleared by the company. One of those cleared sites was a large stone feature depicting the Big Dipper constellation (“Iyokaptan Tanka”). According to Tim Mentz Sr., the tribe’s former historic preservation officer, the area was the final resting place of an historical figure. Faith Spotted Eagle, who lives on the Yankton Sioux Reservation of South Dakota, frames the pipeline construction in this manner: What if the Great Sioux Nation decided to build a project through Arlington Cemetery? But Energy Transfer Partners insists that they are “not destroying [any] important historical sites.” How Energy Transfer Partners, led by billionaire CEO Kelcy Warren, determines “importance” is ambiguous, though they clearly do not rely on the testimony of indigenous peoples. The heart of the struggle, however, is Water. Water is sacred and the “first” medicine for the Oceti Sakowin (People of the Seven Council Fires – Lakota, Nakota, Dakota). Spiritual leaders have always emphasized the connections between the People and Water. This is a universal truth as water is as essential as the air we breathe. All life depends on it to survive. The ancestors of the Oceti Sakowin teach that water holds memories and the knowledge of life as it flows through all living beings and makes the journey from land to air and back to land again. When the Dakota Access Pipeline finally ruptures, its impact will span thousands of miles and hundreds of years. Not only is the drinking water of the Standing Rock Sioux Tribe and those downriver placed at risk, but the very fabric of their culture, and therefore of the broader hemispheric culture, will be subject to irreparable harm. Sam Spurrell is a student of Political Science, French and Psychology at Amherst College.